It sometimes amazes me at how few ingredients can come together and form something so wonderfully tasty...and that's this salsa! 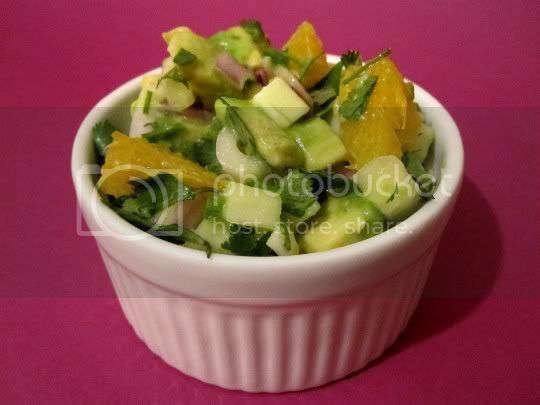 Diced avocado (not mashed, you want to keep the chunky texture), orange segments, cucumber, jalapeno, red onion, and cilantro are tossed with lime juice...and that's it! You've got a cross between a fresh salad, guacamole, and salsa. The avocado is creamy and buttery, the cucumber adds a nice fresh crunch, and the orange adds bursts of juicy sweetness. The red onion and jalapeno add that spicy pungent bite, and the cilantro gives that oh-so-necessary tangy Southwestern flavor. The recipe suggests adding salt to taste, but with the extra tangy lime juice, you really won't need it (maybe try some pepper instead for a little kick). Serve this yummy stuff with chips, atop a bowl of chili, atop any Mexican food, or maybe even as a sandwich spread. Regardless of its use, you won't be sorry! Make again? Definitely. As much as I love guacamole, I knew I'd for sure love this (and I'm ashamed to say I ate the entire dish!). Looks really good! I may consider eating some vegetarian meals!